Here at Pierburg’s new Niederrhein plant, change is the order of the day. Among the projects is the assembly of the newest generation of solenoid valves up to readiness for series production. Rolf Linsen (l.) and Lutz Plasmeier are in charge of Preproduction and Casting. Together they personify the plant’s casting and processing expertise. The worldwide mechatronic plants make use of the products developed and experience gained at Neuss to achieve cost-efficient volume production processes. 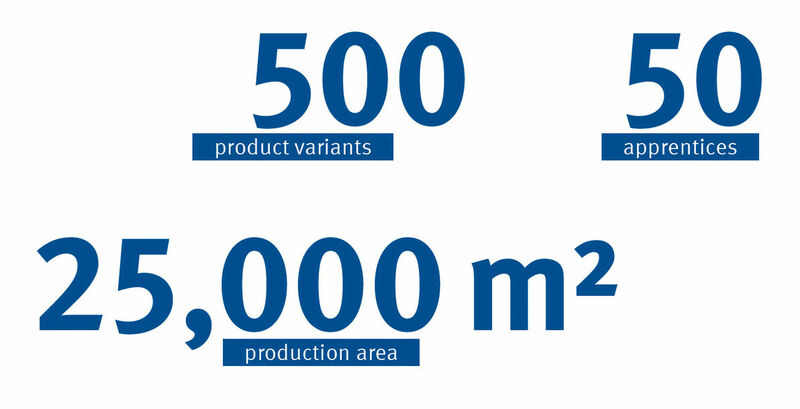 The technology plant in Neuss also transfers to sister plants around the world the production lines for product generations already established in Europe. Moreover, the global Pierburg Group also benefits from the castings expertise that is the second mainstay of this plant inaugurated on the pier in Neuss in 2014. The thinking behind a technology plant is that a production facility in Germany will only remain competitive by being ahead in product and process engineering. “This means,” says plant manager Dr. Jochen Luft, “that the newest generations of valves are developed to series production maturity here with us. ”Should a customer later wish to internationalize a product, for example in an Asian market, the production line can be transferred to our Chinese affiliate in Kunshan. Mario Schäfer, Head of Assembly, adds, “In this way, we are in a position to transfer the system as a plug-and-play solution, including local training by our skilled workers.” The technology plant is thus in line with the corporate strategy of “local for local” and the requirements of the OEMs who get technological expertise, innovative processes as well as production locations that are globally competitive. Upstream production is connected to the Center of Competence (COC). As the Niederrhein plant is the only one at Pierburg with casting competence, it has a special significance. The aim is to collect experience in upstream production—comprising the casting and machining operations—to develop this experience into innovative processes and then to make it available to the entire Pierburg Group right from the product development phase. “At present we’re the nucleus of what will later be implemented elsewhere,” is how COC Head Lutz Plasmeier outlines the perspective. “The casting shop, too, is still in the development phase,” says Rolf Linsen, Head of Preproduction. Here, the move started later and two machines still have to be set up. In order to be able to carry out the relocation at all, production in advance of demand was stepped up at Nettetal. Whereas the Nettetal foundry chiefly turned out products for its own assembly line, the Niederrhein plant produces and machines aluminum die-cast products from the entire world of Pierburg. In the course of next year, the preproduction operation will be working to full capacity, with its output representing a cross section of the Pierburg portfolio. “The important thing,” says Dr. Luft, “is that our process know-how in matters of product development is channeled into both the solenoid valves and the castings. In this way, we create a synthesis of functionality and producibility.” Once the engineering design has progressed to maturity, the component can be produced in top quality and cost competitively anywhere in the world. 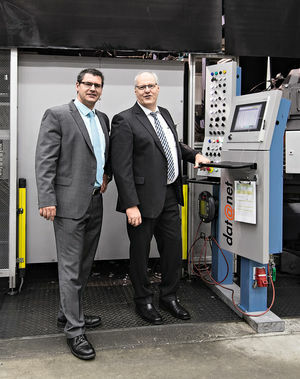 “This is where we are reinventing ourselves—with new technologies,” adds the plant manager. Apropos readjustment: How employees are readied for the readjustment and their fears and uncertainties dispelled is something that Dr. Luft and his managers have demonstrated in Neuss. “It was the biggest challenge,” confirms the 39-year-old, who moved with his family from the Czech plant Ústí to the Niederrhein in 2014. He helped to alleviate the uncertainties by practicing an appreciative, candid, and goal-oriented style of leadership along with a policy of seamless employee integration. “Even before the actual move, we invited the whole workforce to attend monthly briefings at which we strengthened our sense of togetherness by calling ourselves the Niederrhein Team and creating an emblem of our own,” says Dr. Luft. He developed a set of guidelines in which he defined the culture, mission, and goals of the Niederrhein plant. 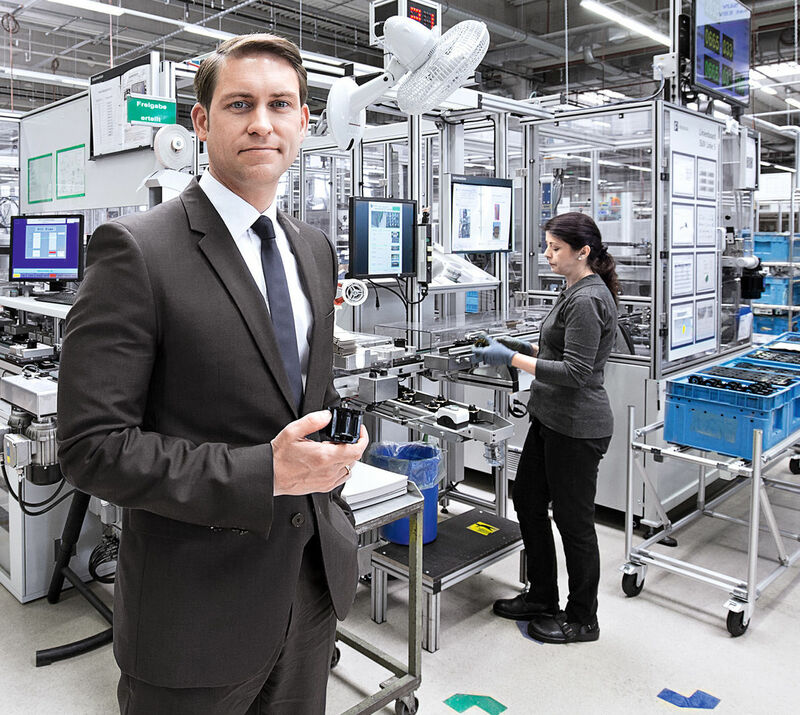 Mario Schäfer heads the Assembly unit at the new Neuss plant. 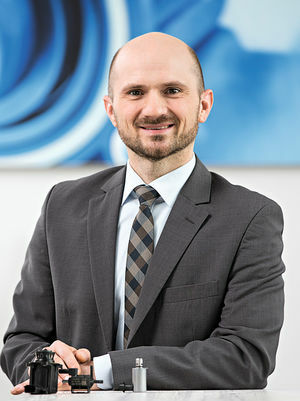 “Every day we’re busy generating enthusiasm among our employees and convincing them that there must be changes if we are to improve ourselves,” explains the Head of Assembly, Mario Schäfer. He cites an example: “We make our improvements measurable in terms of figures. For the assembly operations, Overall Equipment Efficiency (OEE) is a key indicator that we determine on a daily basis. I want everyone involved to realize what this figure means and how it can be improved.” The 800 improvement suggestions submitted in 2015 for the whole plant show that the message has reached the minds of the workforce and been translated into action. Markus Willemsen is responsible for keeping the plant logistics flowing. “Only a few minutes ago,” says Markus Willemsen, Head of Logistics, “a young colleague came up with an idea for making our high-bay warehouse even faster.” With this willingness to get involved and contribute, processes are continuously being fine-tuned. “For instance, we were able to reduce the number of forklifts by 30 percent, because the travel distances are now much shorter,” Willemsen adds. Besides the enhanced efficiency, two certificates, Authorized Economic Operator and Known Consignor, generate important competitive advantages. Thus, the cost of additional security measures at the airports is eliminated which, when exporting to 29 countries, adds up to quite a bit. Even during the preliminary stages, the logistics specialists contributed their expertise to the design of the assembly shop. This cross-departmental cooperation is perpetuated in day-to-day work. “Our 70-strong team requires, first and foremost, all-rounders that at least broadly understand and can do each and every job. We’re increasingly imparting such skills,” says Willemsen, who moved from Nettetal to Neuss. Along with his team, he works in an open-plan office where he can be contacted at all times. To address ever-new challenges, a special willingness is required on the part of the workforce. 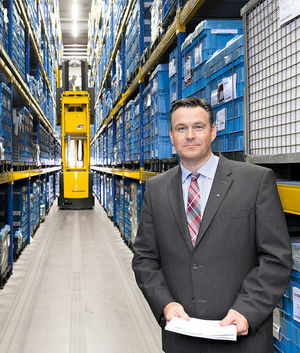 Bearing this in mind, plant manager Dr. Jochen Luft seized a great opportunity that came his way: with the 700 employees from the Neuss and Nettetal plants, he made new beginnings the subject of a program—with transparency, regular briefings, and a new sense of togetherness as the Niederrhein Team.